Mainly suitable for stainless steel and other metal plate surface grinding finishing processing. After processing, steel plate surface straight to the shallow grain filament, and the surface is smooth, in order to reach the purpose of light decoration. 1, only need to connect the power cord can production. 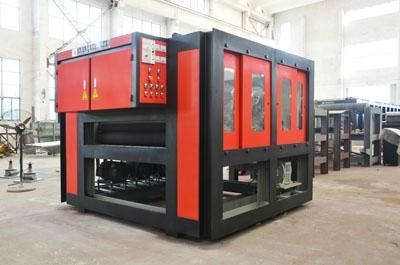 2, material stocky, manufacturing precision, stable running and hard to fault. 3, the main body steel structure, sufficient strength and stiffness, compact structure, beautiful appearance generous, anticorrosion coating. The other's modern metal materials co., LTD in wuxi city, can according to customer demand for various types of stainless steel plate, aluminum plate surface mirror polishing and silking processing, such as NO. 3 / NO. 4 (also known as snow pattern, short silk, snowflake sand, etc. ), the HL (also called filament, wire, straight hair, etc. ); Processing silking effect will be for processing materials, abrasives, rotational speed, the work environment varies. To learn more technical parameters, etc., please telephone to inquire or visit factory, thank you!